Last week in "Life After Debt" I wrote about avoiding getting back into the debt trap. Another thing to consider as you're clawing your way out of debt is to be aware of how painful your situation is. Write these feelings down and keep them where you can review them from time to time. The best time to review these feelings is when you're contemplating making that purchase of something you don't really need and will throw you back into the depths of debt. Besides the feelings you had when you're deep in debt, or also in the process of paying down your debt, I'd like to mention some physical ailments afflicting my clients and workshop attendees at that time: skin irritations, upset stomachs, even ulcers, anxiety, alcohol abuse and insomnia. An alternative would be to use cash. 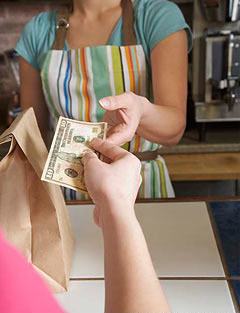 Research indicates you will spend 20% less if you use cash. Why? Because you're giving something up. If you use a credit card, you get it back and you haven't been deprived of anything. There's got to be something psychological about that. Interestingly, in a workshop I was giving in Chicago, a woman mentioned that she only carries $20 in cash for that reason. She said, "Money burns a hole in my pocket, and if it's there, I'll spend it." Okay, so there may be a few exceptions out there, but for the most part, most people don't like to depart with their cash. So, are you thinking of going to the grocery store next time with cash only? You might have to put some goodies back...Please let me know next time you go to the grocery store and if you purchase with cash; also let me know if you bought less.